Artwork inspires the work place. 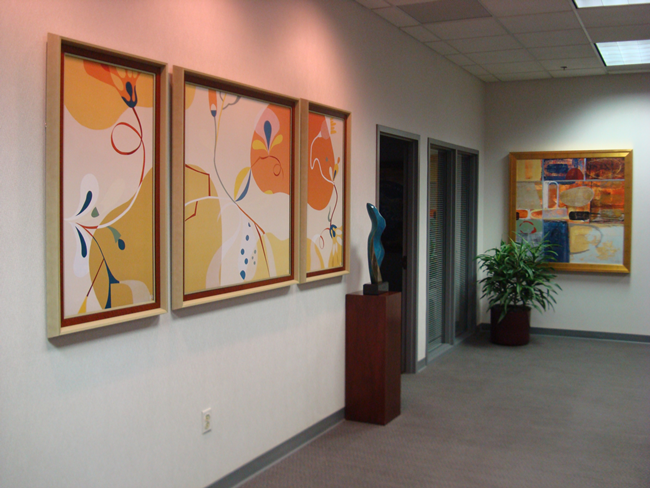 Stimulating artwork inspires employees and provides an enviroment that fosters creativity and well-being. Tasteful art reflects your corporate personality. If your goal is to project an impression of professionalism and class, do it with art. HPG can transform any space into an inspirational, professional venue. Start the energy flowing from the inside out! Updating: Let us take your existing art and clean it up a little. In many cases a new mat, clean glass and a touch-up and polish for the frame gives new life to your initial investment. Upgrading: If you love your office art, but are constantly reminded that teal and sea foam went out in the 80’s – a new mat and updated frame will protect your initial investment and give it a face lift that will last for another 20 years. Has your company moved or expanded? We can easily match your existing art to your new surroundings – and give you prudent advice regarding your budget concerns, mix in some newer styles, and even find matching or complimentary pieces.